It all starts with the sheep being milked twice a day (sounds like a lot of work to me) and the milk is then held in a temperature controlled receptacle until it’s time to make the cheese. The milk is poured into this amazing copper cauldron sitting over a flame and rennet is added. I’m going to give you the simplified version as I don’t really remember all the steps involved. 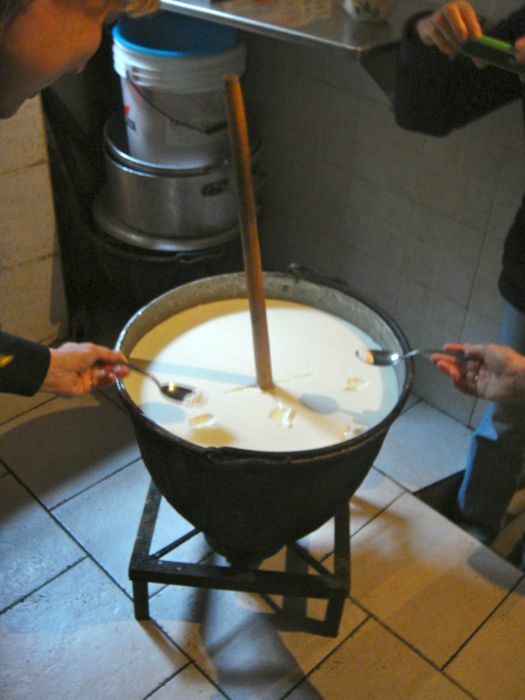 Quite early on we were able to taste this warm and very creamy substance that had formed at the top of the pot. 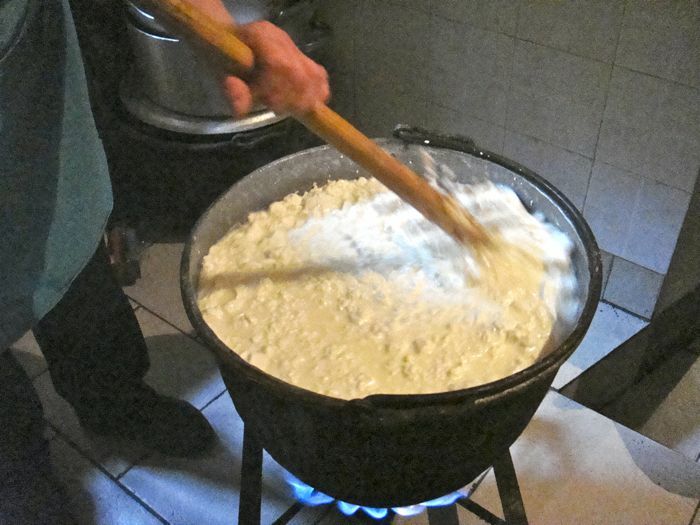 As curds form the mixture is stirred around with a large rake-like stick. 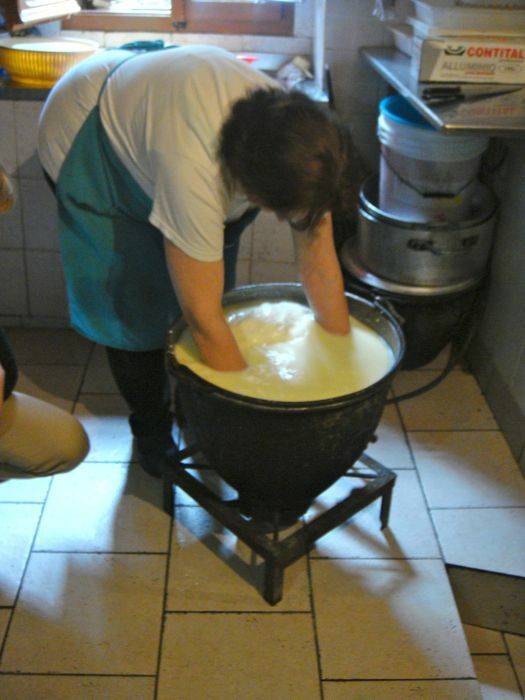 Eventually a large mass of cheese begins to form out the bottom of the pot. I’m not quite sure how hot that milk is, but as you can see the woman of the household has her arms in there as she works on gathering the large clump that has come together. She pulled out this massive pieces and proceeded to cut it into thirds. These were then pressed into molds where they will drain. 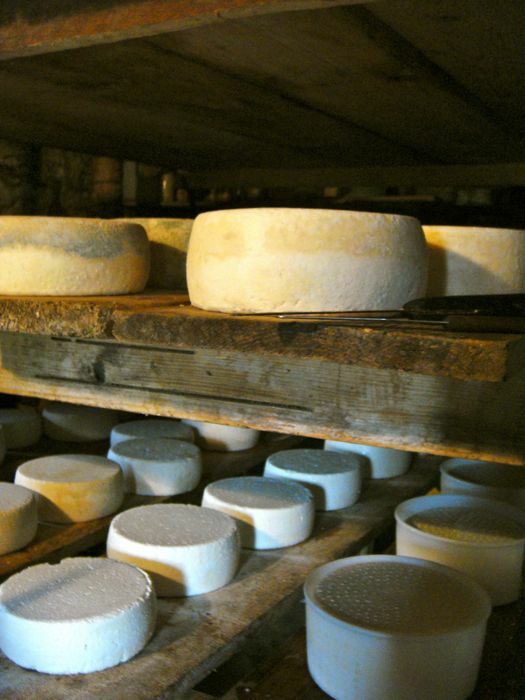 In the meantime we took a trip down to the cellar where the cheeses are aged. 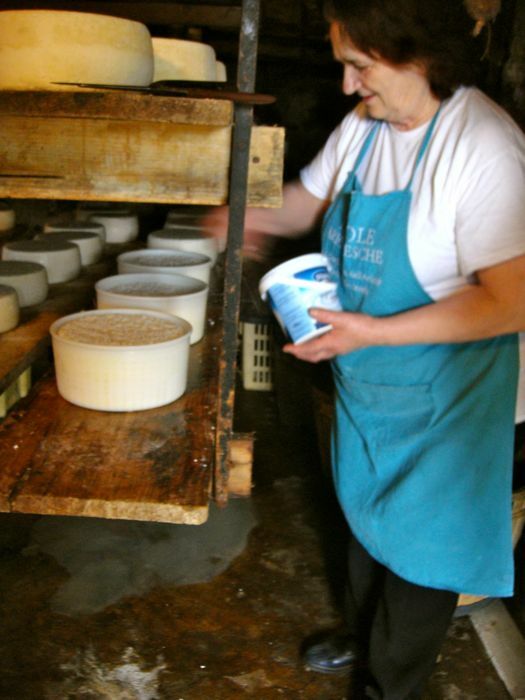 There we saw rounds of pecorino at various stages of aging. They are salted fairly early on (correct me Heather if I’m wrong about this) as you can see la signora doing. We inquired as to who was going to eat all this cheese and whether it was for sale and were informed that it’s for the family’s consumption and friends who stop by to make a purchase. I wish I was on that list. 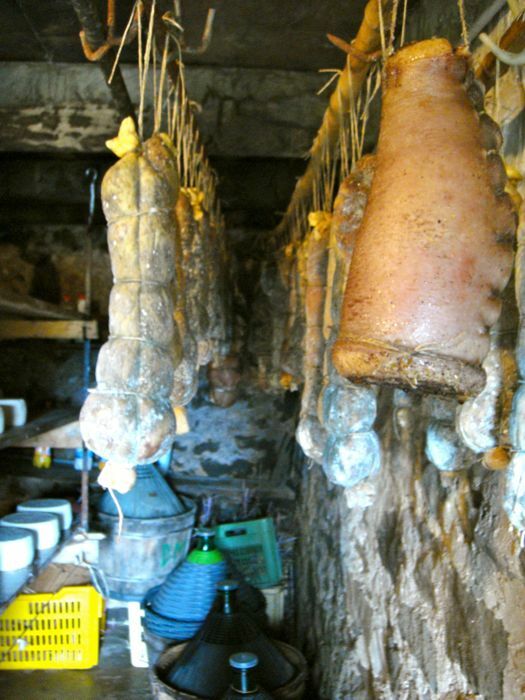 The cellar also was also home to a variety of homemade salumi, also in the process of aging. Check out those large wine jugs peaking out at the bottom of the photo. 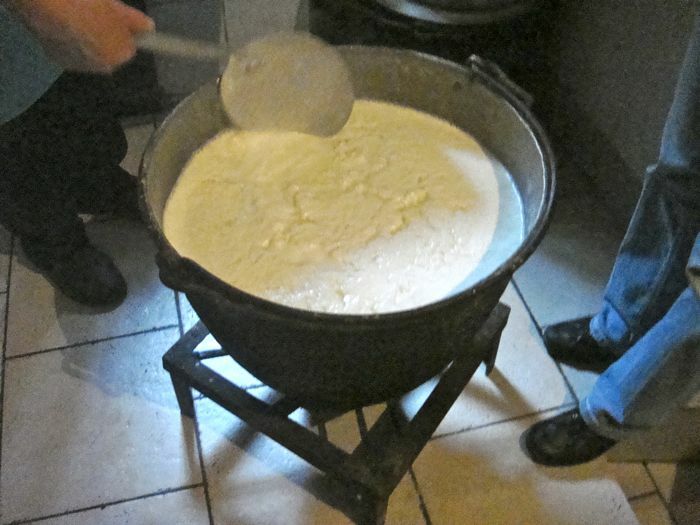 And one last step-the making of ricotta with the leftover whey. This is heated up almost to a boil and then the curds (if that’s the right word) are placed in another mold. We got to taste this too and oh my, how delicious right out of the pot! We did get to sample some of the aged cheese and yes, it was amazing. 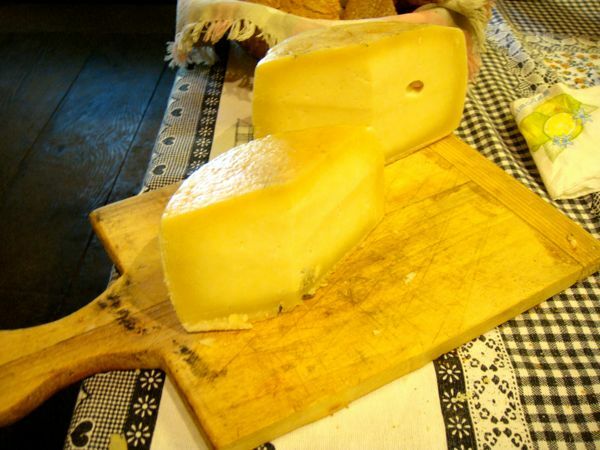 My fascination with pecorino began some years back on our first trip to Italy. It was a cold and rainy day and all the shops and restaurants were closed except a small enoteca. We ordered wine and lamented the fact that there was no place to get a bite to eat. With that the gentleman working there went and prepared us a plate of salumi and pecorino cheese. I was won over in an instant and whenever I’m in Italy I try to eat as much as I can. I lament the fact that I can’t really find good pecorino in San Diego. At any rate it was my fascination with this cheese that led me to Heather and ultimately to this charming farm at the top of the mountain. Thank you for one very memorable day. 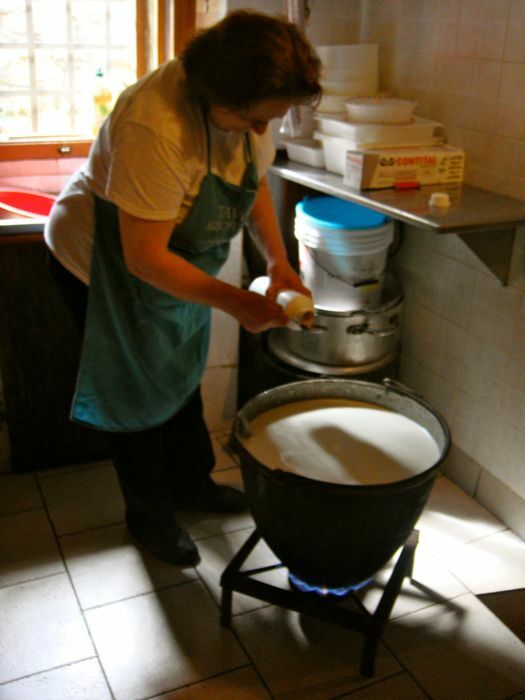 Gorgeous photos of Gemma and her pecorino and ricotta, Janie! Your description captures the essence of the process. It’s much harder to describe in words than to understand when you can see it. Everyone has to come and experience it. Heather-thank you for the compliment. You are absolutely right-they need to come and see for themselves. It’s such a special experience and your knowledge of the area ad its food is amazing. Heather-thanks for your reply-I will make sure Tea With Betty sees it. Tea With Betty-see Heather’s response about ricotta. We can make a type of cheese similar to ricotta (which I have done)-one gallon of milk yielded about 1/2 cup-not enough to really do anything with! I spread it on crostini. I would love to be trapped in that cellar for a while. I’d need some bread of course. Gorgeous post Janie. You lucky thing!! No problem, Janine. Gemma also makes bread in her wood-fired oven. Thanks for letting us tag along with your group! And for the post – I will repost it to Godzillavilla’s facebook page, and that’s one less I need to write! Shelagh-we loved having you both along-it added to the fun and we certainly enjoyed hearing about your project. What an incredible experience! I watched my mom’s video of the cheese being formed. So cool! Lauren-wish you could have been there-you would have loved it! Anne-I am sadly gone from Bologna and am back in CA. Bonnie-I’m so happy that you enjoyed it! It really was as special day.